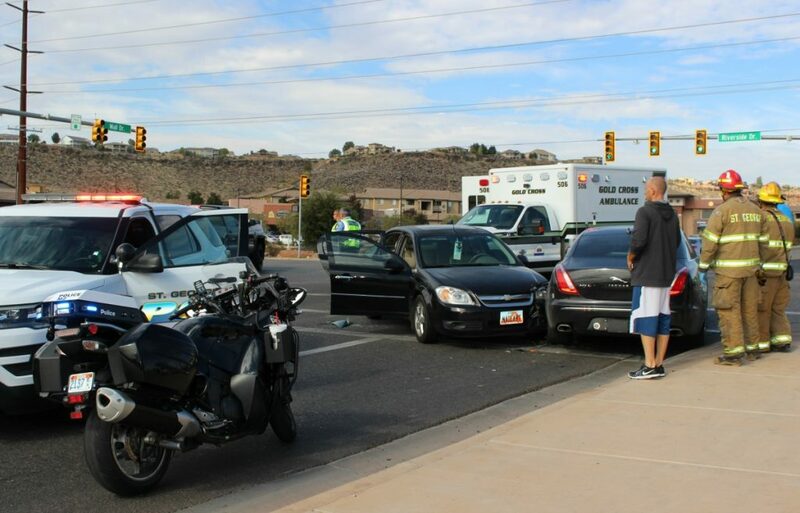 ST. GEORGE — A driver was transported to the hospital unresponsive after a three-vehicle collision prompted by a driver who failed to yield while making a left turn Thursday. Just before 11:30 a.m. officers and emergency personnel were dispatched to the intersection of South Mall Drive and East Riverside Drive with an unconscious driver reported to be inside of one of the vehicles, St. George Police Officer Dave McDaniel said. Two Gold Cross ambulances were also dispatched to the scene due to the number of vehicles and possible injuries. 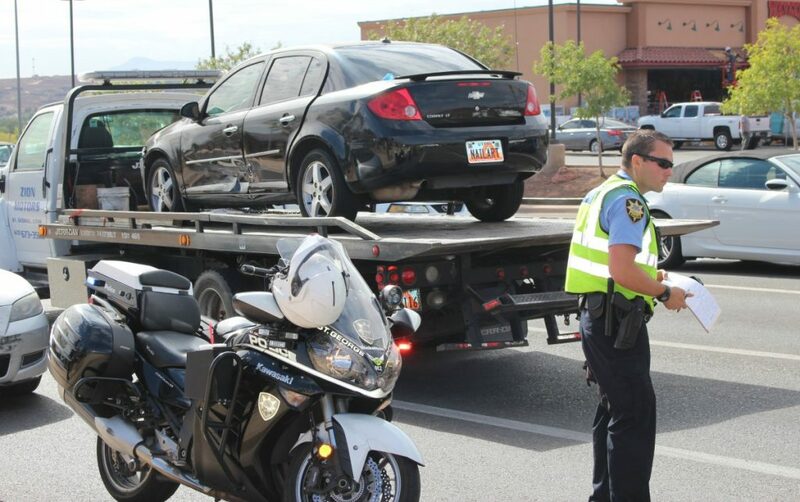 Responders found the unresponsive man inside of a black Chevrolet Cobalt and after firefighters were able to remove him from the car he was transported to Dixie Regional Medical Center by ambulance. 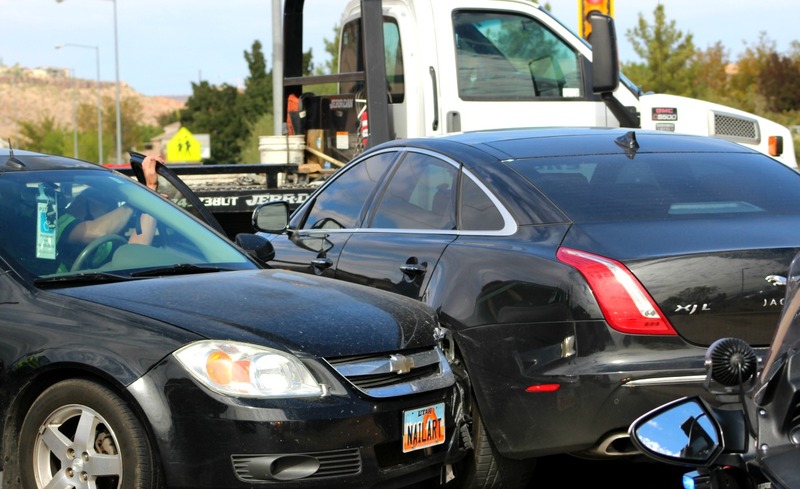 The Cobalt was smashed into the front of a black Jaguar driven by a man who reported he was uninjured in the crash, the officer said, while the woman driving the third vehicle, a silver Mazda 3, who reported no injuries to her and her daughter who was restrained in a car seat. Both northbound lanes of Mall Drive were blocked immediately after the crash, and traffic began to back up but was later diverted from the scene by police. While investigating the crash, officers learned that the Mazda, westbound on East Riverside Drive, merged into the left turn lane to head south on Mall Drive while the Cobalt was heading east on the same road, McDaniel said. The vehicles collided when the Mazda driver pulled into the path of the Cobalt. The impact spun the vehicle around and knocked the driver unconscious. “It was not a major collision at first, but was enough to knock out the driver in the Cobalt,” McDaniel said. The car then spun around and continued through the intersection until it struck the front of the Jaguar that was waiting to make a right turn onto Riverside Drive. 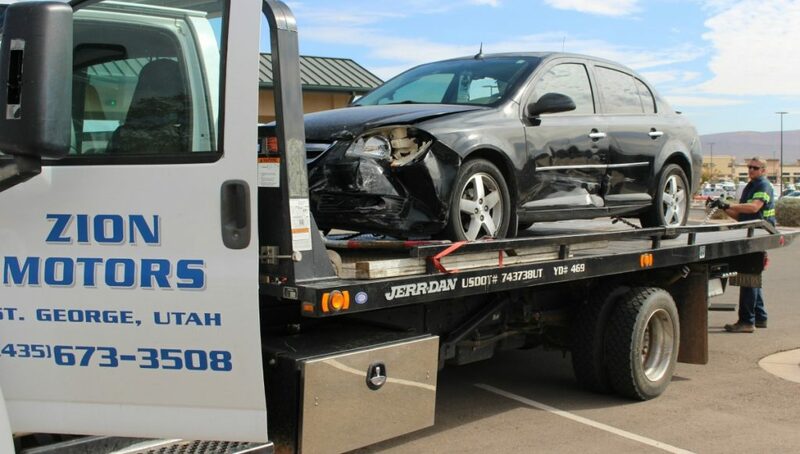 All drivers and the child passenger were properly restrained at the time of the crash, and the Cobalt and Jaguar sustained extensive damage and were towed from the scene. No further information regarding the Cobalt driver’s condition was available at the writing of this report. The driver of the Mazda was cited for failing to yield on a left turn. 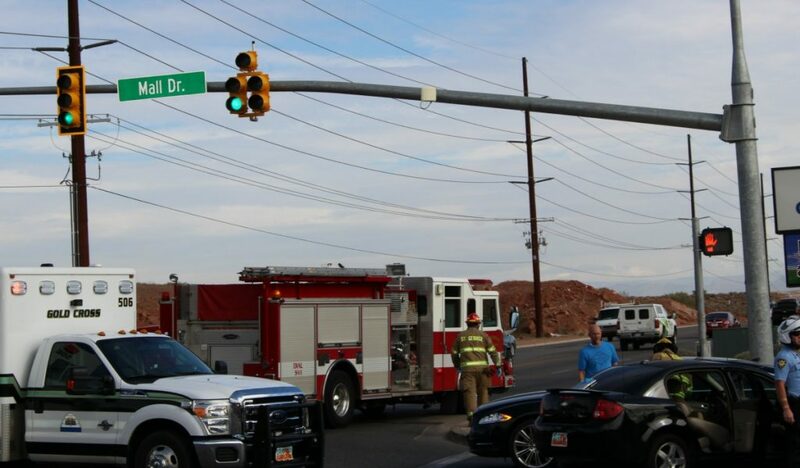 The St. George Police Department, St. George Fire Department and Gold Cross Ambulance responded and tended to the large scene. It is sad enough when a driver puts themselves at risk by failing to yield, but this mother not only put herself, but her young daughter, and two totally innocent drivers at risk. Injuries appear limited, but this could have been worse. It is hard to imagine what could have been so urgent to risk your child’s life, if the Cobalt had instead been a truck?